Abu Dhabi: Four-time champion Japan’s 3-1 loss to Qatar was a hard pill to swallow but their manager Hajime Moriyasu didn’t shy away from accepting that they were beaten by the “best team” in the Asian Cup. “For me, the best team in the Asian Cup is the team that wins the title, and Qatar proved to be that team. My congratulations to the Qatar technical staff and the players for a great tournament,” said Moriyasu after the final. “As for us, we will have to go back to the drawing board and analyse our performances in the tournament and the Japan national team for the future,” added Moriyasu, whose side were on the backfoot after Qatar’s Almoez Ali put them in the lead with a brilliant bicycle-kick and Abdelaziz Hatim fired a left-footer into the top far corner to put their side 2-0 up at the break. “Obviously, we are very disappointed. 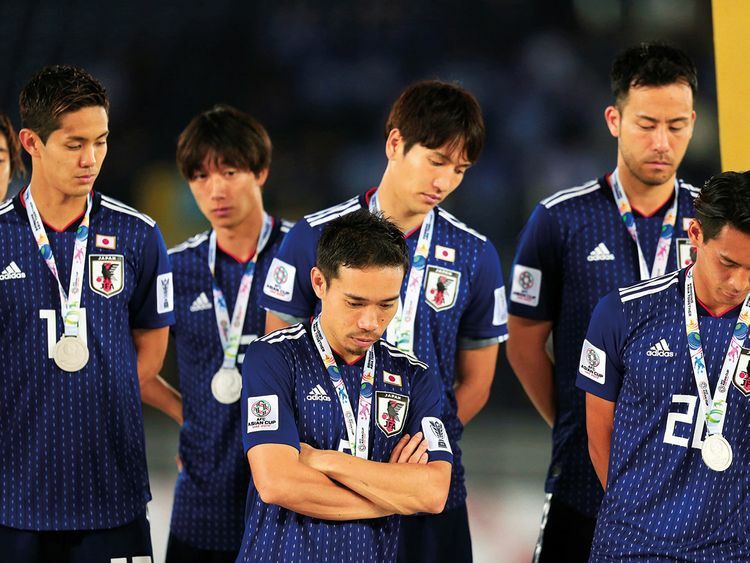 I and my players apologise to the Japanese people who came all the way to support us in the stadium and those who supported us from back home,” said Moriyasu, whose side pulled one back in the 69th minute through Takumi Minamino to keep them in the game. However, a contentious penalty following a VAR which showed Abdelkarim Hassan’s header strike against captain Maya Yoshida’s hand and was converted from the spot by Akram Hassan Afif, sealed the fate of Japan. A dejected-looking Yoshida felt that it was one of the most painful loss of his career but felt the penalty was a bit too harsh. “Losing the final is always a difficult defeat and really painful indeed but we have to learn from this. First of all Qatar is a fantastic team and deserved to become champion today, to be honest. I have to accept when you lose by 3-1 then there is no excuse,” said Yoshida, adding that, their rivals were more aggressive in their approach from the beginning. “Qatar played well and we were too passive in the first half and, when you concede two goals in the first half it was always going to be really difficult to come back from that. “We tried to, but still time wasn’t enough. Especially the third goal: me, individually, it’s really tough to accept. It’s really unlucky to have the handball. But this is the result,” said Yoshida, who wasn’t that pleased when journalists probed if he felt it was not a penalty. Qatar coach Felix Sanchez was clearly on cloud nine following the win and he hailed his side for the effort they put all through the tournament. “Tonight we made history for Qatar. We are very proud of our achievement. It was hard work and commitment all the way, till this night. “We played against the top quality team. It was a huge result for us. We started the first 10 minutes with control over Japan and played good football for 30 minutes to score two goals,” said Sanchez, adding that Japan came back strong in the second half but they were prepared for that and showed nerves of steel once to the reduce the margin. “We knew they would come back strong but we managed to hold them back. In the second half, Japan played solid game for 25 minutes and scored a goal. I think we matched them in every line and scored a third goal,” added Sanchez.